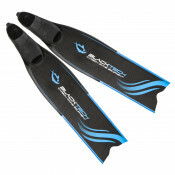 BlackTech fins are some of the most advanced freediving and spearfishing fins in the world! Offering unmatched power and resilience, they are the fins of choice for professional and recreational spearfisherman and freedivers alike. • Rinse you fins well in fresh water after each use. 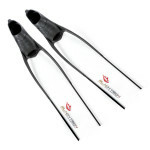 • Do not leave your fins to dry in direct sunlight. • Do not expose the fins to temperatures higher than 60 degrees C.
• Avoid jumping in the water - fins first. • Avoid pushing off the surface with the edge or tip of the fins. • Avoid hitting sharp / hard objects underwater. The blade's tip is especially vulnerable to this kind of damage. • BlackTech blades must be stored carefully after use in order to avoid creating deformation and breakage. Avoid vertical storage and long exposure to the sun. This Limited warranty is offered by BLACKTECH for the best support service to the consumer, and does not replace nor limit the rights guaranteed by law in compliance with the rules of Directive 1999/44/CE/ on certain aspects of the sale of consumer goods and associated guarantees, implemented in Croatian Consumer Protection Act. 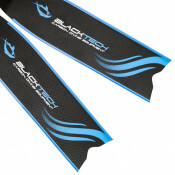 Lenght and conditions of validity: BLACKTECH warrants to the original purchase only, that this product, purchased from an Authorized BLACKTECH Dealer, will be free of defects in material and/or workmanship, under normal recreational diving and swimming use for carbon blades for a period of 3 years, and for ICE fiberglass blades for a period of 1 year from the product purchase date. This date must be verified by a valid sales document (sales receipt). Warranty claims must be submitted to the Authorized BLACKTECH dealer where the Product was purchased within 30 days of when the defect is found. When a claim is submitted, the product must also be supplied along with the valid sales document and this Warranty Certificate completed in full. The Dealer will deliver the product to BLACKTECH. BLACKTECH reserves the right to refuse free service if the required documentation cannot be provided or if information is incomplete, illegible, or incorrect. Content of the Warranty: during the warranty period, if a defect is found that is attributable to defects in materials or workmanship, BLACKTECH at its own disrection, will repair or replace the claimed product without any expense to the consumer. BLACKTECH reserves the right to replace the claimed Product with a similar product of comparable value in case of unavailability of the Product. All products that BLACKTECH has replaced shall become the property of BLACKTECH. Any replaced product does not extend the original warranty beyond the period of 3 years for carbon blades and 1 year for ICE fiberglass blades from original date of purchase. If the Product is found not to be covered by the terms and conditions of this Limited Warranty, BLACKTECH reserves the right to charge a handling fee. 1. Defects or damage caused by heavy, unusual, or incorrect use under abnormal conditions (blows, jerks, falls, bumps, etc.). 2. Defects or damages caused by lack of or incorrect maintanance or through negligence or maintenance by an unauthorized BLACKTECH Dealer. 3. Defects or damages known or evident at the time of purchase of the Product. 4. Clear defects or damage, tacitly accepted, that did not interfere with the products's operation. 5. Scratches or damages to the surfaces and external areas due to normal use of the product. 6. Defects or damages caused by cleaning materials or other substances containing aggressive chemicals (solvents, surfactants, aggressive cleaners etc.). 7. Defects or damages resulting from alterations and changes made to the Products without authorization. 8. Defects or damages caused by improper assembly of the components. 9. Defects or damages caused by prolonged use of the Product in chlorinated or polluted water. 10. Defects or damages caused by exposing the Product to excessive temperatures, fire, or prolonged exposure to sunlight. Technical operations conducted on products by Unauthorized personnel will result in the loss of all rights under the BLACKTECH Warranty. This warranty does not cover equipment used for rental, military or commercial purposes. For additional information, please contact customer support by using our contact form or at the following email address: support@freedivershop.de. Limitations of liability: BLACKTECH shall not be liable for any injury or damage that may, directly or indirectly, occur to persons, things, animals resulting from the use of BLACKTECH products. BLACKTECH will not be held responsible for any agreements written or oral except of those that are a part of this warranty statement. BLACKTECH entire liability shall be limited to repair or replacement of the product at BLACKTECH option. BLACKTECH will not pay any compensation for any inconveniences which might be caused by the inability to use the Product or for any potential expenses incurred while the Product is being repeared or replaced. The blades are guaranteed to be free of defects in material and workmanship. The warranty does not cover improper use or tampering. Defective blades will only be replaced if they are returned along with a copy of the receipt as proof of purchase. Our online support team will be happy to assist you with any further questions or concerns you may have. If you require any help or advice in order to select the best product for your needs, simply drop us a line at support@freedivershop.de or send us a message using the contact form on our site and one of our representatives will get back to you shortly.